A Windmill was used mainly to pump water. Usually, three days supply of water was stored in the tower. Blades - called "sails" - are attached to the wheel at the top of the tower. They are mounted at an angle to catch the wind and turn when the wind blows. These blades could be tilted to increase or decrease their speed. In light wind, the blades are flat to catch most of the breeze. As the wind increase, the blades tilt forward to control the speed. The tail keeps the windmill pointing in the direction of the wind. The use of the windmill is confined almost exclusively to the pumping of water. Sufficient water should be stored to last at least three days. The windmill is used in a limited way for grinding feed and for running machines, such as grindstones, lathes, shellers, etc., if one is prepared to do the work when the wind is blowing. The foundation of the tower posts are usually of concrete, set at least five feet in the ground. Wood towers were usually replaced with metal past 1890. The height of the tower varies from 10 ft. to 100 ft., as it should be high enough to raise the wheel above the level of all objects such as buildings, windbreaks, and hills, within 500 ft. of the mill. The wheel consists of a steel framework upon which are mounted the sails, which may be of either wood or steel. The sails are set at an angle to the plane of the wheel. This angle varies from twenty to thirty degrees and is known as the angle of weather. There is a wide variation in the width of sail, though the wider sail, measuring some twelve inches seems to be more generally used. Motion is transmitted from the shaft to the pump rod either directly through a pitman-wheel connection, when it is known as a direct connected mill, or indirectly, through spur gears, when it is known as a hack-geared mill. Since a pump should not be operated at a faster rate than forty strokes per minute, it is very necessary to have some device on the wheel that will keep the speed within a proper limit. Such a device is called a governor and operates in such a way as to turn the wheel toward or away from the plane perpendicular to the wind's velocity, thus exposing more or less surface to the driving force of the wind. Automatic regulators may be attached to any mill by means of which, through a float connection with a near-be tank, it may he automatically thrown out of gear when tank is filled and thrown in gear when the tank is empty. During a high wind, when the wheel tends to turn into a plane parallel to the wind's direction and thus to be thrown out of gear, the governor, usually a long coiled spring, operates to hold the wheel toward the wind at a proper angle to secure the desired speed. The tension of this spring can usually be controlled so as to regulate the speed to the work which the mill has to do the rudder in a position to hold the wheel in a plane at right angles to the wind's direction. As the velocity of the wind increases the wheel tends to turn toward the rudder, thus placing the coiled spring under tension. As the velocity of the wind decreases the coiled spring draws the wheel back into the wind. Windmills were mostly replaced with gasoline or electric pumps in the early 1900's. They are still used in regions without power, and can be used now to generate electric power. Known as the Halladay design, the blade sections could be tilted to decrease the rate of speed. This was a common pattern by the 1880's. This has an all metal frame and drive rods. Looking up at the banks of blades the mechanism which tilts the banks of blades into the wind can be seen. In light wind the banks of blades are flat to capture the most of the wind. As the speed increases the banks of blades slowly tilt forward to capture less of the wind to keep the speed constant. It is in the "out of sail" position now and captures so little wind no spinning will occur. The tail keeps the windmill pointing in the direction of the wind. 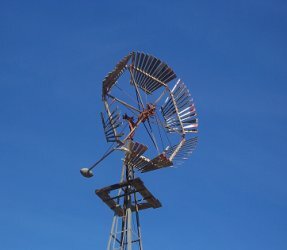 As the windmill turns motion is transmitted from the shaft to the pump rod either directly through a pitman-wheel connection, which pumps water into the barrel.